1What plastics can be printed with the DyzEND? 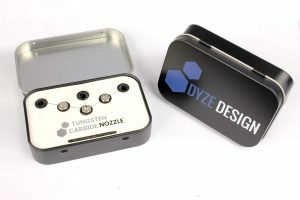 DyzEND nozzle is optimized to work with DyzeXtruder. 2How accurate is the temperature thermistor? 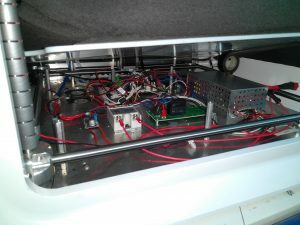 As you can read inside the "How can this hotend get as high as 500°C ?" FAQ topic, the resolution isn't great below 40°C. However, this thermistor is currently the most sensitive sensor available for very accurate reading at printing temperature, between 180°C and 450°C. At its peak, the resolution goes up to 5.70 increment per degree, or 0.175 degree. This sensor is far superior than the traditional 100K NTC, PT1000 or even amplified PT100. 3What is the maximum speed of DyzEND ? 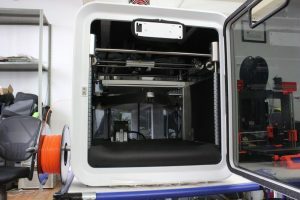 DyzEND is capable of printing at speeds beyond 150 mm/s depending on the printer and the extruder. In terms of volume, one can reach up to 40 mm^3/s. 4Why is Titanium used? Isn't it as conductive as Stainless Steel? Yes, pure titanium is as conductive as stainless steel. However, stainless steel is an alloy containing mostly iron. In almost all cases, when a metal is alloyed, the thermal and electric conductivity are reduced. This means that iron conduct heat a lot better than steel or stainless steel. For your reference, the actual thermal conductivity of iron is about 80 W/m.K, and 16 W/m.K for stainless steel. As you can see, the thermal properties are pretty different. The same effect happens when alloying titanium, and this is the reason why we have chosen this metal. Our titanium alloys is a lot less conductive than stainless and allow a much compact and efficient design. 5Why is the heatbreak so small? The heatbreak is small to lower the heat conduction. Two factors mainly affect heat conduction: material thermal conductivity and cross section area. By reducing the cross section area, the amount of heat that travels to the cold zone is reduced. The top part need to keep the filament cold so it can stay strong and hard. Despite it's small size, the titanium heatbreak is very strong and won't be damaged under normal operation. 6Do I need to assemble my nozzle? The DyzEND is delivered assembled. We ensure the quality of our products and they are tested before being sent to ensure compliance according to our high standards. You only need to insert the heater cartridge and tighten the thermistor and you are ready to go. 7What are the connectors being used ? The connectors are Molex Mini-Fit Jr™. They are widely used, especially in computers. We offer 1 meter cable with connector for our products. 8How can this hotend get as high as 500°C ? The thermistor used with our hotends is very unique and it can handle up to 500°C. There are no parts other than metals inside the hot zone, which is why we call this kind of hotends "100% metal". Most hotends use a standard 100 kΩ NTC thermistor which allow them to reach between 235°C and 300°C. The low temperature range enable them to be somewhat accurate at room temperature. The trade off with a 500°C thermistor is that the accuracy at room temperature have to be compromised for the extra 200°C it can handle. This is due to the ADC (Analog-to-Digital Converter) used in most ATMEL chips that has 10 bits resolution, which means it can differentiate 1024 values. Once the hotend has reached 40°C, the resolution gets good for accurate measurements. At printing temperature, the 500°C thermistor has an excellent resolution, better than any other thermistors, it reaches 5 increments per degree, which means about 0.2 °C accuracy. For safety purpose, we need to modify the firmware to implement a workaround for the low resolution at room temperature. You can find the guide in the support section for our DyzEnd. 9Why is it uncommon to see hotend that can be heated to over 250 Celsius and what is the point ? The design of a nozzle which can range to over 250 Celsius is an art in itself. A higher temperature allows to use a greater variety of filaments. 10Can I turn the heatblock in a different orientation? Although it is possible, it is not suggested. It will impact the heating time and the maximum temperature reachable. The heatblock is designed to be as far as possible from the wind generated by the fan. By positioning it in a different position, there are more heat losses. We strongly suggest to keep the original orientation for optimal performance. 11Can I add a resistance in parallel or change the pullup to get better readings? Adding a resistance in parallel will reduce the resolution of the thermistor. The current will pass through the parallel resistor instead of the thermistor and the overall output volage difference will be decreased. Changing the pullup resistor can have an interesting effect on readings. in fact, having a lower resistance value will improve resolution at high temperature, but lower it at low temperature. The opposite is true with a higher resistance value. Readings would be better at low temperature, but worse at higher temperature. The very common 4.7 kΩ is considered as a standard and yield to a very good compromise between resolution in low temperature and high temperature. 1Why would I choose DyzeXtruder? First, the DyzeXtruder work nicely with flexible filaments. It is guided throughout the length of the extruder. The frame extends closely up to the driving gear.This extruder is very easy to install with the mounting holes on its side. Only one side needs to be held, the other can be use for fan and other accessories.It is bowden ready and groove-mount ready. 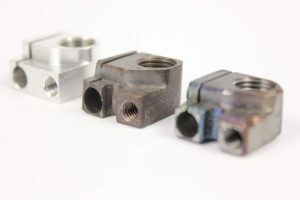 Any size of groove-mount can be installed. The adjustment is made from top and is very convenient for quick hotend swapping.The top latch makes it very easy and fast to change the filament.The housing is made from aluminum and is very solid. This extruder is made to last. 2Can I adjust the spring tension? The spring is specially made and the optimal force has been calculated to give the best performance out of this extruder.Too much force and the filament could be damaged before entering the hotend. Too little force and the filament could slip and start grinding. The current setup is just the right force to keep the best performance from the chosen motor.